Innumerable contestants, close to 100 nominated blogs and 16 winners emerging in the grand finale to the Indibloggies 2004. This year’s event has been spectacular for Indibloggies with an unprecedented nine sponsors offering prizes worth above Rs.25000 and a panel of 12 Jurors who had the momentous task of frisking the list. I do not have enough words to show my appreciation for all those who participated in the event. The apprehensions on the award's credibility also prompted me to reveal my identity, I had resorted to the pseudonym Indiblogger when I started the affair because I thought an identity is always accompanied with prejudices, I am happy I was proven wrong. So here is the much awaited final list of winners. My congratulations to all the winners. My thanks also to all those who voted and kept visiting these pages. Winners Must send me an email at indibloggies at gmail dot com with subject "Prize claim" so that I could forward their details to the sponsors. $25 Amazon gift certificate from Shanti and..
Best Group IndiBlog : Zoo station (31% Votes). Wins a Gift Certificate from Amazon or Crossword, courtesy Blogstreet. Best Sports IndiBlog : Cricinfo : 23 Yards (90% Votes). Wins a license of FeedDemon 1.10 worth $29.95. Best science/technology IndiBlog : Sadagopan's weblog (45% Votes). Sadagopan wins a 1-year Typepad Plus subscription worth $120, courtesy Anand. Best Topical IndiBlog : Shiok (43% Votes). a license of FeedDemon 1.10 worth $29.95. Best New IndiBlog : India uncut (45% Votes). Best Humanities IndiBlog : Lazygeek (77% Votes). Best Indiblog Tagline : Ravikiran (58% Votes). Ravikiran wins a copy of Blogjet's Weblog client for Windows worth $19.95. Indiblog Lifetime achiever : Kiruba shankar (52% Votes). Kiruba wins a license of FeedDemon 1.10 worth $29.95. We have one ritual left for this years awards so do visit again. If you are into statistics, the polls have been archived for posterity here. Displays a good understanding of rural and semi-urban India and his blog covers related business and economic trends, technologies and ideas. Consistently blogging good stuff on Management and HR from an Indian point of view. Topical, thoughtful, interesting, identifies and covers the topics that really matter, non-pseudo; Sharply opinionated erudition qualify them to be contenders for the top award. A thought leader and one the most influential Indian bloggers around. A group blog that brings good insights to a wide variety of topics from terrorism to classical music. A great blog with specific interest in all things Bangladesh, excellent analysis of South-Asian and American politics. It mobilized the various people around the world and provided a single point of information for the Tsunami relief. A great example of power of blog medium. A group blog by a bunch of Indian Americans who write about all sorts of topics. 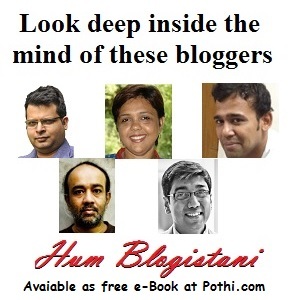 Their eclectic mix of entries makes it a must read for anyone who is interested in Indian Blogging! Like the variety in this blog, plus it's clean and unostentatious. Off late contains a lot of links and pictures, you won't miss any interesting story of the day if you subscribe to the blog. Teakada: Relevant, topical, and multi-opinionated. 23 Yards: Focused, Professional, Informed, insightful (and not just passionate opinions). It does have an articlish feel, rather than that of a blog. Ramesh Jain: the guru of multimedia search, internationally. Sadagopan's weblog: Extensive in writing and has personal insights on the IT industry. Sadagopan's weblog is an excellent commentary on various Emerging Technologies, Thoughts, Ideas, Trends and Cyber world. Very well written and shows the thought process from a deep experience. Although he could use a little bigger font on his blog; Lots of new info with explanation and analysis of emerging trends placing technology in context. ; Extensive in writing and has personal insights on the IT industry. Movalog: Helps in building on the cutting edge of this new technology. Actually useful resource for MT users. Gigaom: He has the uncanny ability to review and analyze various things happening in tech world. When world was singing praises of Gmail he raised the flag of disenchantment. Popular around the blogosphere for not just news on broadband, as his tagline suggests, but on technology in general. Ofcourse, being a part of Business 2.0 helps a lot in getting various scoops he manages to obtain. TechWhack: Don't take his younger age for his naiveté in tech areas. If you subscribe to google news you would often find his posts on the front page in TechSection. Scientific Indian: Scian brings some very informational tidbits on science. It is a welcome change just when your head starts spinning with all the politics and philosophical talk going around. They too have a mela of sorts called the "Scian Melt". Overall it tries to make things very interesting for readers. The Dreamer: Though this is not purely technical, there is quite a bit of technical posts. The Radiohead: Very well written technical blog. Trend Space: Tracks trends and look for patterns in popular culture, technology, demographics. Blogstreet India: India's First Blogs and RSS Portal. This year also saw the launch of the most ambitious project in the history of Indian blogging. They organize the blogs based on geographical location and rank them based on inter-linking amongst the blogs that are in the directory. Also cool is the feature on their site is the book, music and DVD recommendations. Chittha Vishwa: One of the most unique dynamic service built upon open resources that includes a hand-sewn blog aggregator, blogger profiles, blog reviews and up-todate list of Hindi blogs. The first ever such effort in Hindi blogdom all over. Blame India Watch:The other side of the offshoring story. As it says - Don't blame India, or Indians. Tsunami Help: Its commendable what these guys are doing - useful stuff. Media Musings: Somebody needs to monitor Indian media, seriously. Spontaneous Order: Attempting to impart some sense into economic policy-making. For their stubbornness they end up being nominees in the one-track mind category. The Acorn: Separates himself from the crowd and dedicatedly writes on the issues of Terrorism and Security affairs of the Nuclear powers in the South East Asia and Gulf. In terms of posts he is a curt machine, always awake and churning out those commentaries and news analysis as they happen. Raj's Photoblog: Breath-taking! His art has a distinct uniqueness that takes you into each picture as if you were there in person. The diversity of his subjects and his skill at framing each photograph just right gives all the other photo-enthusiasts a lot to learn from. Shutterbug: The sheer diversity of the subjects in Nilesh's photography alone makes it worthwhile to follow the photolog on a regular basis. His photographic skills and technique are freakin' amazing! ; Lots of commentaries, previews into other pics, flawless pics, unique collection of panoramas, in short: a lensmen's perspective for a layman. Hacking Photography Bird-Watching: He has very interesting write-ups with the photos he publishes. The technical quality of the photos is almost professional. The only flaw I could find was the breadth of work. But then the title says - "Hacking Photography Bird-Watching". You shouldn't be complaining! New Delhi times: Very clean and informative blog. The Middle stage: Interesting posts, some provokes and some leave you thinking. Armorgeddon: Musings of a military man in Iraq talking about things you can only see in the news about, by Neil Prakash. Fursatiya: one of its kind new addition to Hindi world. His terse commentary on India's culture and its unique idiosyncrasies is a must read. Healso takes his shots on the hindi bloggers and is a joyful addition to hindi blogger cabal. Secular right India: 'opinionatedness' of the Secular Right make them stand out. Anand K: The nerd of Indian and western cinema - for not being able to see movies like all the rest of us do - for reviewing it like it ought to be. Dristikona: A blog from a well experienced person Indra Sharma talks about Indian society and the challenges it faces. He never says a thing in vain and always proposes a solution to these hurdles. We all can learn a lot from his lifelong experiences and thoughts based on these which he shares through his blog. Hope more folks like him will join the bloggerdom. Kingsley: because, he made taglines his regular posts - because, with his taglines -he spoke more than with his posts. Ravikiran: Very witty and different. MadMan: One of the best designed blogs around - I don’t like the pale orange colour, but the other features are cool - a daily link blog, toolbars that hide, good categories, uncluttered design. Elegant and simple design with very nifty features like the Daily Links. Very user-friendly and appealing to the eye while being easy on it. Turban head: has all the snaz to show off! Shiok - Chef's Notes: Simple and elegant in design and rich in content must surely be doing wonders for this blog authored by a restaurant owner in Madras Bangalore. Madman is really elaborate in his recipe descriptions and I am sure quite a few bloggers from India have at one time or the other visited his site. If you haven't, then do take a look and try out his recipes. Sepia Mutiny: In perfect sync with its title. clearly demarcated. The archives page is easy to comprehend for a non-blogger and a search feature helps search through the archives. Amit Karmakar: Again a clean and well coded site. Inspite of the content overload, Amit has managed to place this heavy content in a neat presentable manner. Plus its a snappy website. Quick response is due to the fact that there are so few images. Vin: Never short on new perspectives, never afraid to speak his mind, even to his best friend Jivha - and for his constant re-invention to keep himself relevant. Vinod's Blog: Thoughtful analysis on politics and libertarianism by Vinod, an Indian living in America; amusing and thought-provoking. Nitin Pai: A day is never complete without reading the opinions from his opinionated mind. His writing frequency and insight to the political/foreign policy/financial measures is commendable. He is also proxy-present in Hindi blogger world via his guest posts. Shanti: her idea of starting the Bharatiya Blog Mela more than qualifies her for this nomination. The Blog Mela still draws huge crowds today, two years after the first edition. Vikas Kamat Blogging since July 2001 his is one of the oldest blogs. The author of Kamat's potpouri writes less frequently and the interest smoulders. Dubukku: Because of the tag line. Because of his way of not taking himself too seriously. Because I find him extremely funny. Because, a dubukku (the clever fool) ought to win every once in a while. Mera Panna: Has great posts on everything from India to technology. A good read; has to be the 200 mph train of blog world. He started with blogspot and quickly outgrew to his own domain. His writing style is again unique and he uses various characters real or imaginary god knows for his blog. His writings are the talk of the town in this part of blogging world. There are times when only person writing in Hindi is him. etc. He also has a blog-book about his memoirs in US. Ravi Ratlami ka Hindi Blog aur Ghazals: One of the most prolific writer in Hindi cyber world. He writes on socially relevant issues and all things technical related to Hindi. An accompanying gazal is his trademark and leaves people wondering how does he do it in such a short time. Ravishankar Shrivastava will give away books worth Rs.500/- each to the "Best Indic Blog (Hindi)" and the "Best new Indiblog". Thanks Ravi! Jitendra Chaudhary will award goodies worth Rs.750/- each to the "Best Indic Blog (Hindi)" and Best Indic Blog in the language category that receives the largest number of nominations. He will also award goodies worth Rs.500/- to the "Best Indiblog". Thanks Jitendra! Shanti Mangala will award a $25 Amazon gift certificate to the "Best Indiblog" at Indibloggies 2004. Thanks Shanti! Anand M will give away a 1-year Typepad Plus subscription worth $120 for the winner of the "Best science/technology Indiblog" category. Thanks Anand! Microsoft, India will award one copy of Microsoft Office 2003 Hindi for the Best Indic Blog (Hindi) category winner. Do visit Bhashaindia.com where they are trying to promote Indian language computing on the Microsoft platform. Thanks Deepak! Sidharth Sivasailam will award a $25 Amazon gift certificate to the "Best IndicBlog (Tamil)". Thanks Sid! Blogjet will award one copy of its weblog client for Windows worth $19.95 to each winner of IndiBlog of the year, Indiblog with the best tagline and Best IndiPhotoBlog. Do visit their website. Thanks Dmitry! Blogstreet will award a Gift Certificate from Amazon or Crossword to the winner of Best Group IndiBlog. Thanks Veer! Thanks to all the sponsors from the bottom of our hearts :) Your gesture will surely add strength to the community.